The game did not open well for Philip Rivers, who on his second throw of the day sailed a pass in front of a crosser into zone coverage that went for six the other way. Rivers settled down from there and distributed the ball to his playmakers, being much safer with the ball. The Chargers’ offense mostly went through Melvin Gordon on Sunday. Gordon was the main option in both the passing and rushing attack with 22 touches for over 150 yards. With the Chargers having no success pushing the ball down the field, the handoffs and dump-offs to Gordon were key in moving the ball. The vaunted Chargers secondary had struggled the first three games while last year’s top-graded corner Casey Hayward wasn’t following up his stellar play and giving up big plays. Hayward and company came through outside of allowing a long catch and run to Kittle. Derwin James was excellent once again, as he finished off the game with a hit on Beathard leading to the interception. Another piece that has been missing from the Chargers’ defense the first three weeks has been a consistent pass-rush. That changed today, as Melvin Ingram came to life with several pressures. The unit misses Joey Bosa, so they’ll need performances like this from everyone until he returns. The stat sheet will show that quarterback CJ Beathard had two interceptions, but neither were his fault as one came via a drop in the red zone and the other when he was hit while throwing. Beathard started for an injured Jimmy Garoppolo and played well enough to keep the game within reach. Tight end George Kittle made the most of his opportunities, highlighted by an explosive 85-yard touchdown reception on an out and up where he outran the Chargers’ secondary. Most had been waiting for Kittle to have a breakout game and would have in Week 1 if not for a drop. The best player on the field for the 49ers’ defense was former first-round pick Reuben Foster. He used his superior athleticism to make plays in pass coverage, run defense and rushing the passer. Foster’s speed is an absolute weapon that is not often replicated at the linebacker spot in the NFL. The best play of the day for the 49ers came early with Antone Exum‘s interception return for a touchdown on the first drive of the game. That gave the 49ers the lead that they surrendered just before halftime. Exum was good in coverage all day and made one of the game’s biggest plays. It was just not enough to propel the 49ers to the upset win. 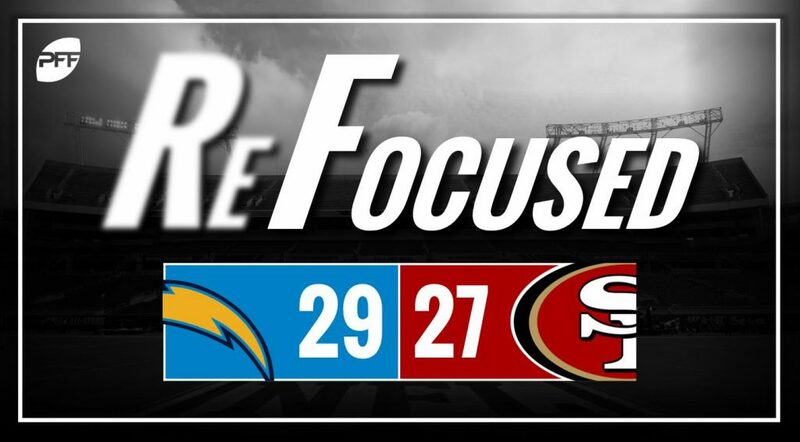 After putting themselves in an early hole, the Chargers slowly but surely took charge of the game against the 49ers. The catalyst for the Chargers’ offense was Gordon, who made enough plays underneath to move the ball when the Chargers could not produce down the field. Beathard was under duress consistently throughout the game, which forced shorter throws and eventually led to the game-clinching interception. The 49ers aren’t likely to contend with their backup quarterback, but their offensive line needs to perform better.